Unit Text:	"A" Coy. 17th Bn. 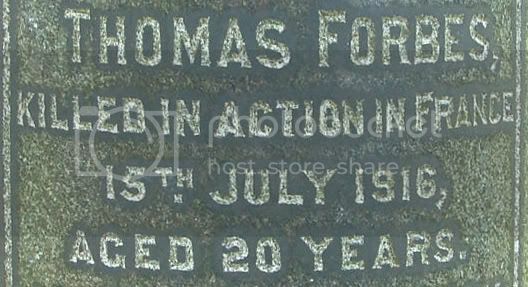 Additional information:	Son of Susan Morrison, of 20, Young Terrace, Springburn, Glasgow, and the late Thomas Morrison. Unit Text:	2nd Field Coy. 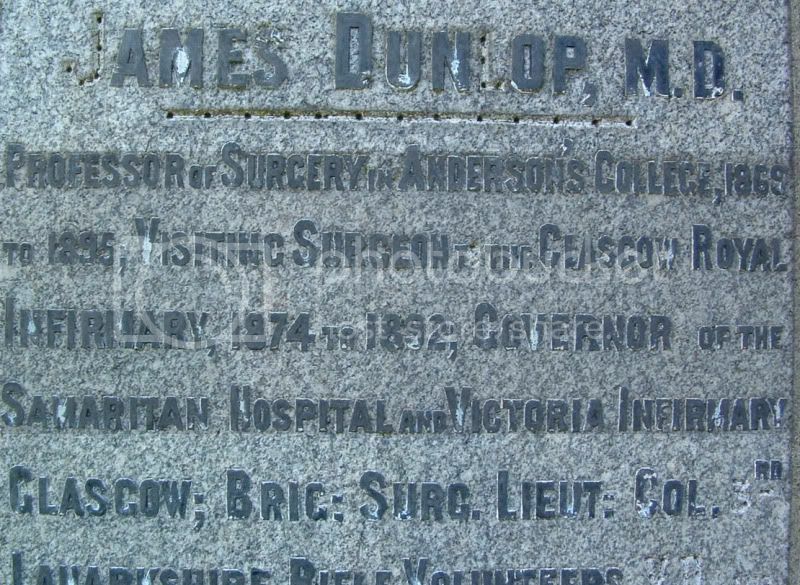 Additional information:	Son of Thomas and Mary Haddow Muir, of 152, Buccleuch St., Glasgow. 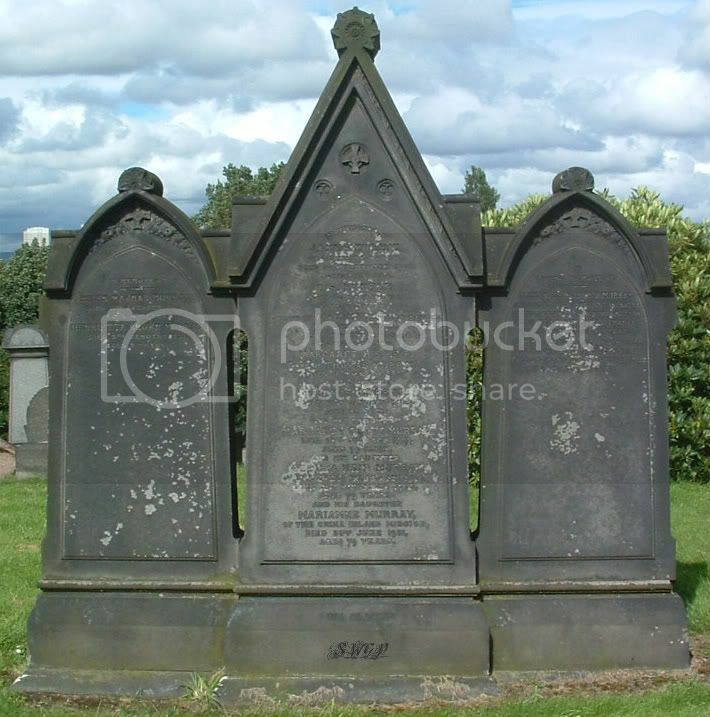 Grave/Memorial Reference:	Panel 23 to 25 or 325 to 328. Unit Text:	4th Bn. attd. 17th Bn. 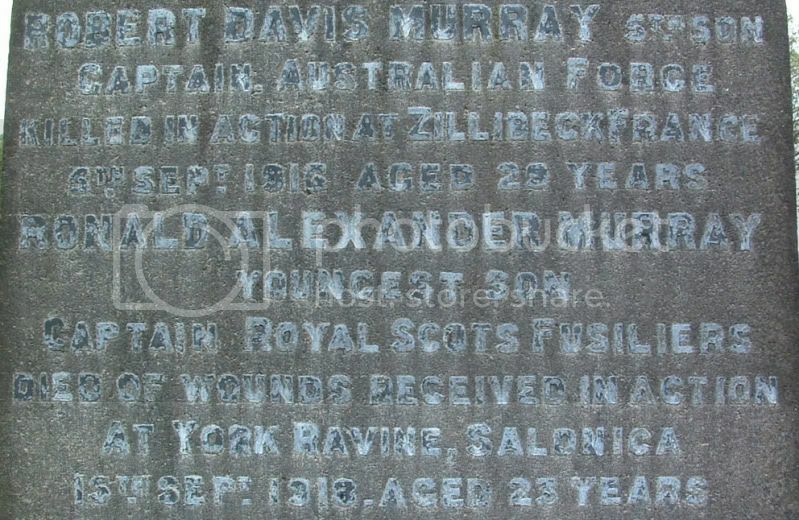 Additional information:	Son of James and Eliza Murray, of 3, Horselethill Rd., Kelvinside, Glasgow. Born at Chungking, West China. 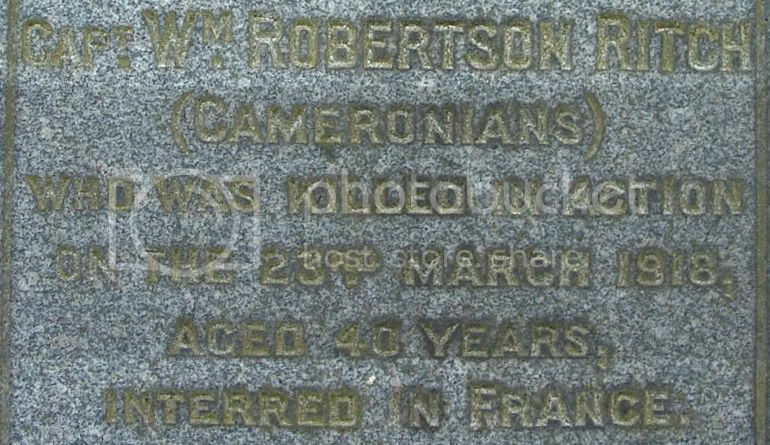 Additional information:	Son of Daniel and Marie Murray, of 5, Wilton Crescent, Glasgow, Scotland. Grave/Memorial Reference:	VI. M. 13. 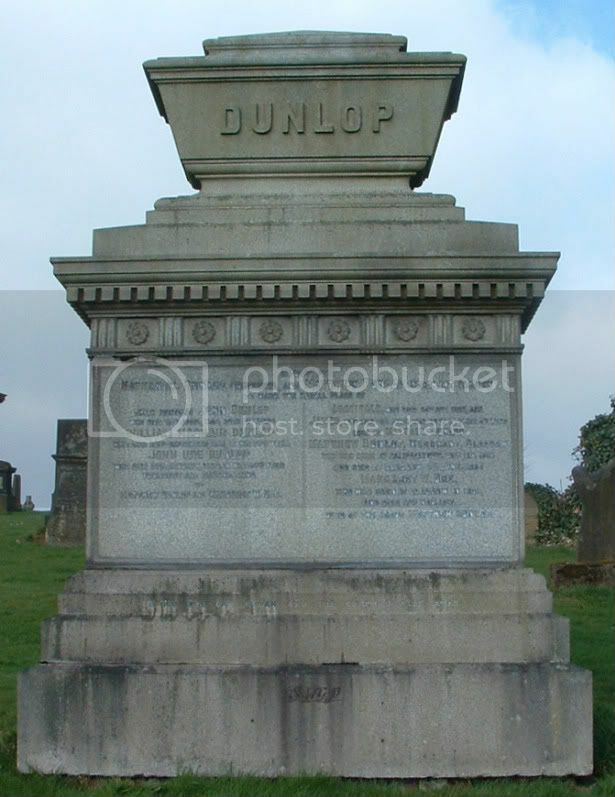 Additional information:	Son of Daniel and Maria Neil Murray, of 5, Wilton Crescent, Glasgow. 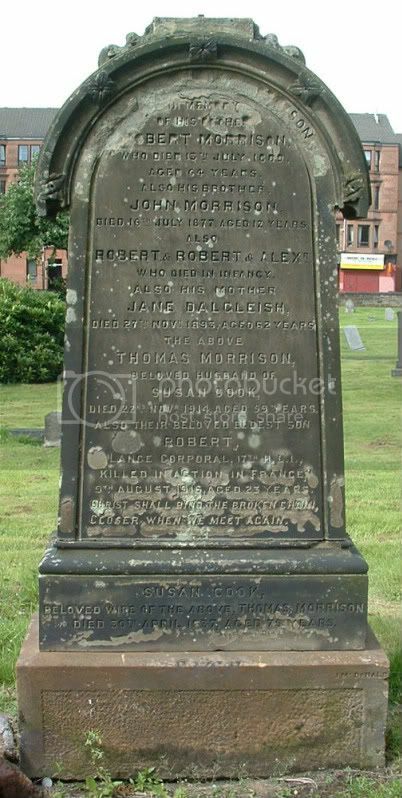 Additional information:	Son of John and Janet Parker (nee Ramsay), of 218, Saracen St., Possilpark, Glasgow. Unit Text:	291st Siege Bty. 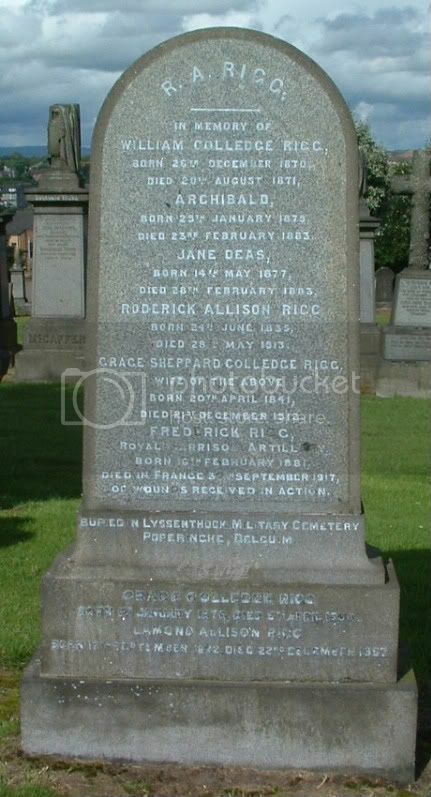 Additional information:	Son of Roderick Allison Rigg and Grace Sheppard Colledge Rigg; husband of Jean Fisher Galloway Rigg, of Blakey's Hotel, Craigmore, Bute. Born Glasgow. Grave/Memorial Reference:	XXIV. B. 18. Unit Text:	11th Bn. attd. 9th Bn. Grave/Memorial Reference:	Panel 37 and 38. Unit Text:	"D" Coy. 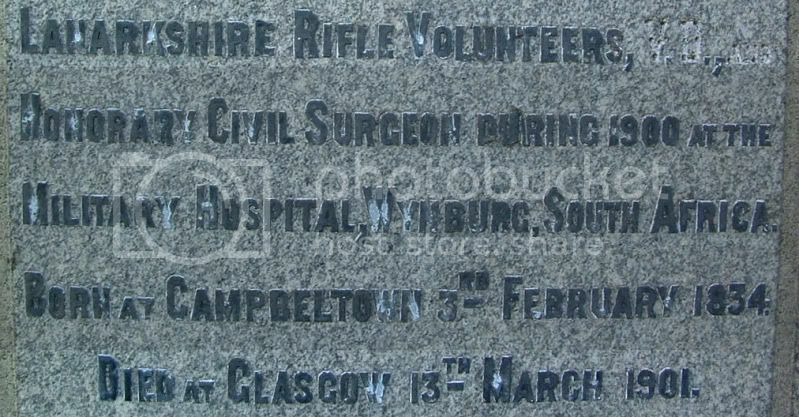 14th (Fife and Forfar Yeomanry) Bn. 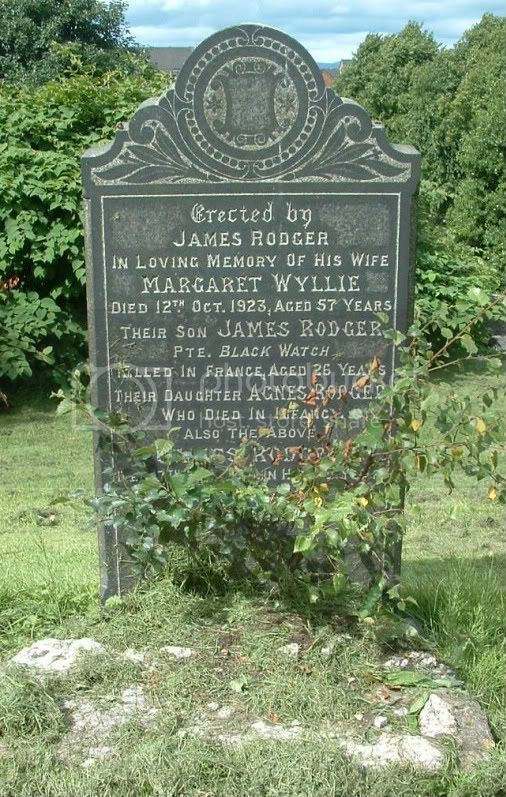 Additional information:	Son of James Rodger, of 224, North Woodside Rd., Glasgow, and the late Margaret Rodger (nee Wylie). 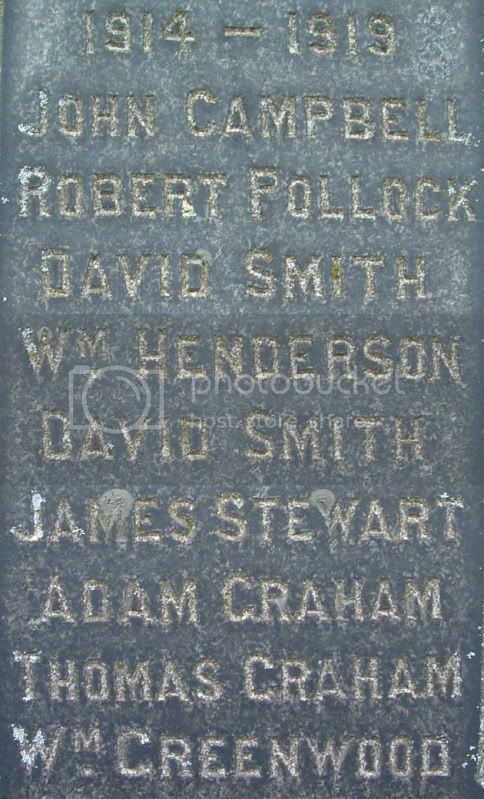 Additional information:	Son of Mr. and Mrs. Robert Sim, of 27, Laverockhall St., Springburn, Glasgow. 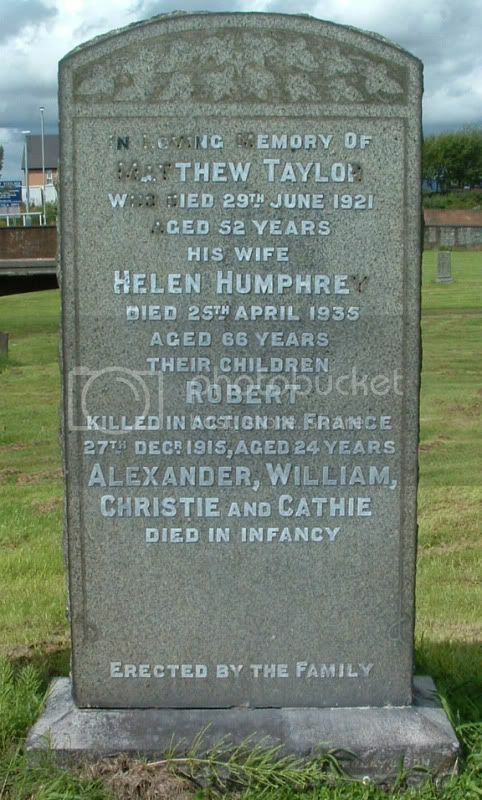 Additional information:	Son of Matthew and Helen Taylor, of 6, Blenheim St., Springburn, Glasgow. Grave/Memorial Reference:	I. C. 21. 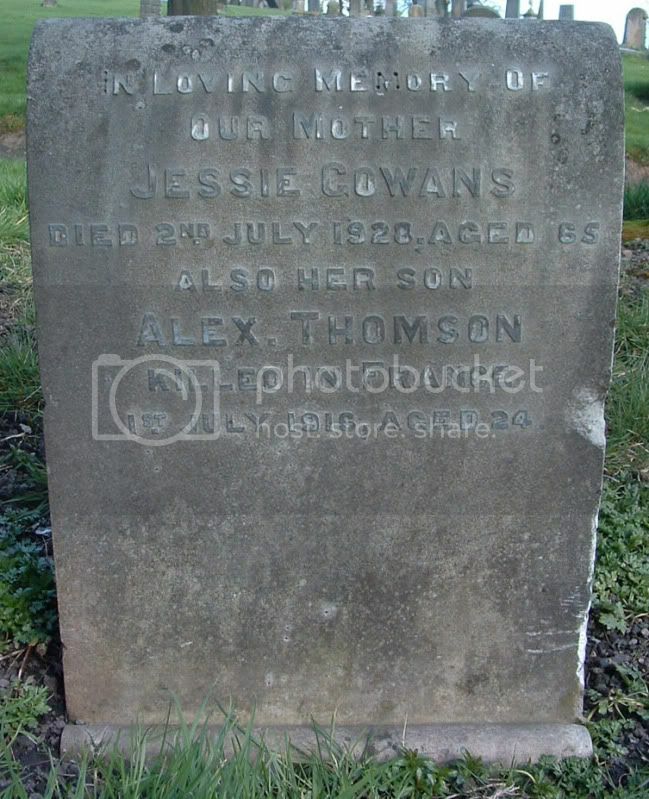 Additional information:	Son of Richard and Jessie Thomson (nee Cowans), of 124, North John St., Glasgow. Grave/Memorial Reference:	II. A. 12. Erected by St. Rollox Lodge No. 7, 1 O.C.T. 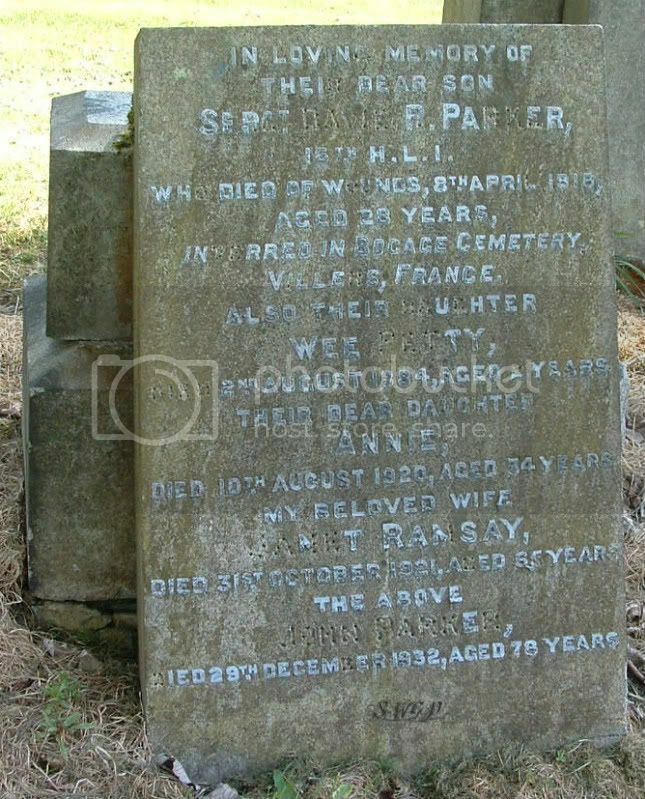 Grandson of Ralph & Jane Briggs.